Most people feel stressed at some point in their life. Maybe you’re facing a hectic work schedule, family issues, or financial pressures. No matter what’s causing your stress, when it’s not managed properly, it can spiral out of control and create a huge domino effect. But, if you do deal with stress the right way, you can avoid a lot of the negative health consequences attributed to stress. In fact, there are plenty of healthy techniques you can use right now to find relief and improve how you and your body react in stressful situations. Here are four tips to help you relieve your daily stresses and feel happier day in and day out. Meditation is touted as a beneficial practice for relieving stress. If you’re new to meditation, it might sound complicated. But it doesn’t have to be. There’s really no wrong or right way to mediate. If you prefer to sit in a cross-legged position and do something more traditional, you can do so. Or, if you want to simply lie on your bed and meditate, that’s works too. You can find many helpful guided meditation options online. Whatever form of meditation you choose, you’ll find that it helps you detach yourself from the things bothering you in life. This can also help you develop better ways to handle hectic situations. Just setting aside the time to pause, clear your thoughts, and become present in the moment can help you get past stress. Another great way to melt away stress is practicing a slow-breathing technique. 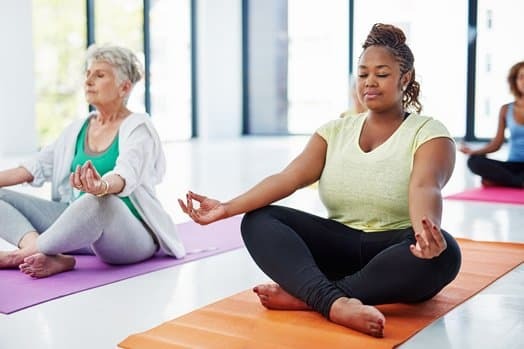 Breathing exercises are especially helpful for extremely stressful situations when you think you may have a panic attack, or for taking a break in the middle of a busy workday. Taking deep, slow breathes helps regulate your heart rate, while giving your mind something else to concentrate on. When you’re feeling extra stressed, you may start breathing quickly and feel like the world is closing in on you. But, by breathing slowly and focusing on your breath, you can calm yourself down and reduce your high, immediate stress level. If you want to clear your head and reduce stress, exercise will do wonders. Maybe you’ve heard the old saying that when you’re upset, you should “walk it off”. Well, when something is troubling you, going for a long walk or jog can really help you relax, burn off steam, and ease your tension. You can also try clearing your mind and relieving stress with resistance training or a fun spin class. Or, to add a breathing and relaxation element to your exercise, try yoga, which can help you feel calm and rejuvenated. The key is to focus on the task at hand, give your mind a rest, and let your body do the work. Plus, after working up a good sweat, you’ll probably find it harder to stay angry, upset, or stressed about something. Ongoing stress is not something you can take lightly — beyond hurting your mood, it can cause health problems ranging from moderate to severe. So, if you’re ready to turn the tide on your stress and anxiousness, we recommend Lumiday, our revolutionary mood enhancement formula that has been scientifically formulated to help promote a positive mood and help reduce stress levels. It’s packed with key nutrients that have been lab-tested for maximum effectiveness. Over time, you’ll feel more positive and upbeat and make those stressful days a thing of the past. Try Lumiday and see what it’s like to smile more, laugh more, and feel the way you want to be.